Apple scheduled its third-quarter conference call for next Tuesday around 2pm PST/ 5pm EST and the pundits, analysts and watchers alike are jumping over each other to predict key business metrics. Big media often refers to Apple as the Wall Street darling and this time around the company’s upcoming earnings will be scrutinized for signs of deceleration because “Apple’s sales could be a litmus test for the extent of the soft patch that struck the economy in recent months”, writes USA Today, speculating that “if demand for Apple’s product wanes, it could mean the downturn is less a soft patch than a hard landing”. 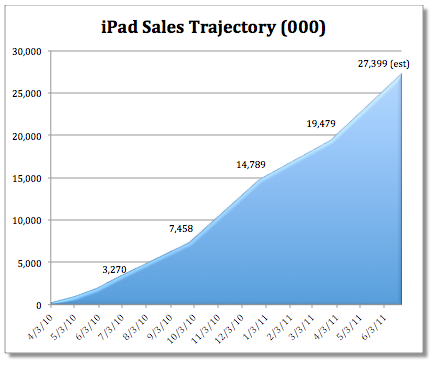 According to the 39 analysts recently polled by Fortune, Apple is estimated to report quarterly iPad sales ranging from six million all the way up to 9.5 million units. Likewise, the publication expects Apple to report 16.9 million iPhones in the June quarter, a bit more than the 16.2 million units shipped during the holiday quarter. 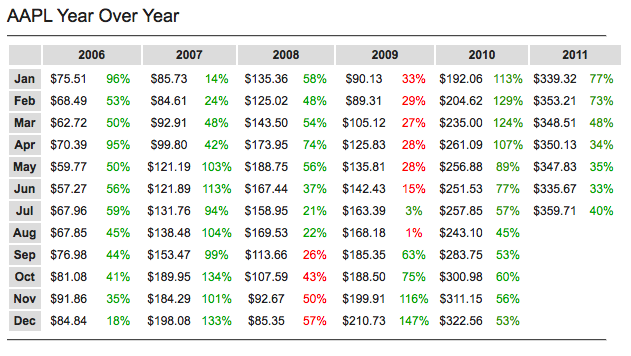 Additionally, Terry Gregory of AAPLInvestors.net compiled a handy table (see above) that highlights the year-over-year percentage increases in Apple’s share price. Apart from the glitches related to the 2008 market crash, Apple’s shares have been on the rise since the beginning of 2006, gaining roughly $100 each year, Fortune’s Philip Elmer-DeWitt pointed out. And despite concerns, Apple stock still has “gas in the tank”, says J.P. Morgan’s Mark Moskowitz. But how do those optimistic estimates stack up against Apple’s March quarter? In the quarter ended March 26, Apple reported sales of 18.65 million iPhones, 4.69 million iPads and 3.67 million Macs and a net profit of $5.99 billion on revenues of $24.67 billion. Compared to the year-ago quarter, profit grew an astounding 95 percent, Mac sales were up 28 percent while iPhones grew 113 percent. The only exemption is their tablet which dropped 17 percent due to the iPad 2 product transition and difficulties in components procurement cause by the Japan earthquake. 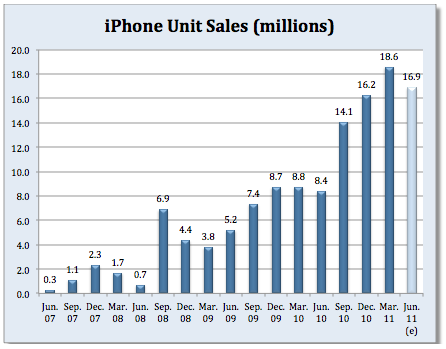 On top of that, Apple appears to be finally tapping the rising economies in Asia and markets elsewhere. Apple reported strong growth in China, in the Asia-Pacific region where quarterly sales rose 151 percent to $4.7 billion and in Europe (a 49 percent increase to $6 billion).